FOOTBALL: FOLLOWING a tense FA Vase win against Lutterworth last week, Coventry United returned to league action against Shepshed Dynamo. And Terry Anderson’s men were rewarded once more with another three points to keep their promotion hopes alive. United wasted no time in signalling their intent as Shepshed keeper Denham Hinds was forced into a good early save to deny Mitchell Piggon in the opening minutes. Piggon was on target again in the eighth minute, but once more Hinds was their to make another good save. Three successive corners ensured Shepshed remained in contention in what proved to be a stop start opening half where neither side could produce a clear cut chance on goal. The visitors went close on 42 minutes when Niall Prenderville had his shot well saved on 42 minutes before Craig Reid’s effort on the stroke of half time was comfortably gathered. Aron Wint replaced Brad Jones for United, and the change in tactics appeared to have a positive effect as Piggon had a chance go just over the bar on 53 minutes before the deadlock was eventually broke when Lewis Rankin’s free-kick found the back of the net. A period of fouls followed before United doubled their lead on 78 minutes when Piggon fired a low drive to register United’s second goal. Piggon was then replaced by Aaron Opoku as Shepshed looked to find a way back into the game. And they did just that when Jake Betts grabbed a injury time goal with three minutes still left to play. 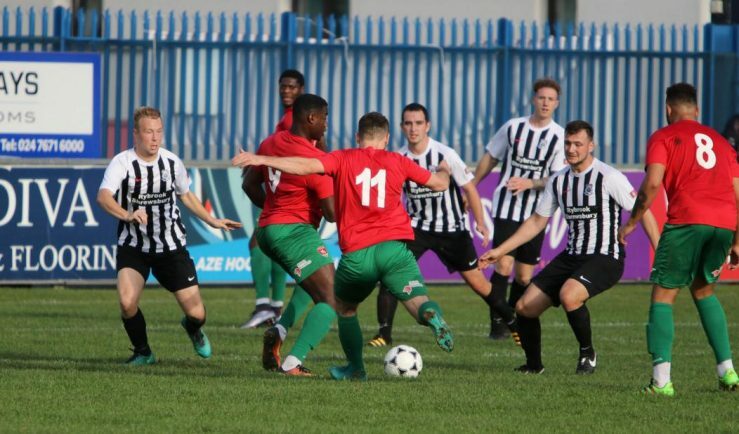 Anderson’s men held on though to bag another three points and keep their promotion hopes alive.